ST. 9 : 17th May - Benevento - S. Giorgio Sannio - 212 Km - Med. M.
ST. 15 : 24th May - Marostica - Madonna di Campiglio 165Km H.Mount. ST. 15 Valdengo - Plan di Montecampione -217Km-H.M.
ST. 16 Ponte di Legno - Val Martello - 139 Km - H.M.
ST. 18 Belluno - Rifugio Panarotta -171Km-H.M.
ST. 20 Maniago - Monte Zoncolan - 167 Km -H.M.
During October 2012 Jerry de Concilio contributed to introduce the Municipality of Naples to RCS management to gain the departure of the Giro 2013 from the city of Naples. 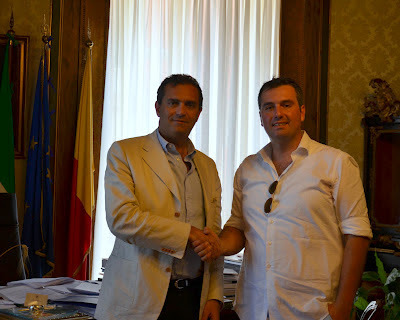 In this picture Jerry is with the major of Naples, Luigi de Magistris, during the presentation of new excursions in the bay of Naples launched by Veloce. Every year our company organizes by request,customized high end bike rentals, daily cycling excursions and vacations along and during the Giro d'Italia stages. This is an exclusive opportunity for the tourists to enjoy routes touched by this beautiful cycling event. Usually we are able to collect and transfer customers from main touristic places touched by the Giro to enjoy daily excursions experiences characterized by guide and team car services with local tasting food tours. This excursions don't need of a minimum number of participants. AVAILABLE SPECIAL SERVICES FOR VIP and CELEBRITIES. Veloce® provides the finest in travel options to our clients with the most discerning taste for excellence. Naples, Ischia, Amalfi and Sorrento coasts ! Adriatic coast : Marche and Abruzzo regions ! Futa pass and finish line in Florence daily excursion ! Potenza, Matera finish line and Altamura !